Winners will be notified via email by getting an Amazon Gift Card or eBook prize. After the chat we will also post the winners on this page. I have definitely found some new to me books and authors to check out. Added several to my TBR, such us, The Dragon King, Stone Hard SEALs, A Leopard's Path, Dragon Her Feet, Thane's Redemption and Viking Claim, to name a few. On May 27, 2015, sienkielsa said: Books! On May 27, 2015, Judy said: Fun Scavenger Hunt! What a fun way to discover new authors! So many of the books sound really good but my favorites are Her Alien Hero and Forsaken! Thanks for the awesome giveaway! Each & every one of these looks like a good read. I have a lot of reading ahead of me. The books I'd like to read our Rogue Wolf, Knight of Rapture, The Dragon King, Tut's Trumpet, Viking Claim, One Bite, Wild Heat, and Dragon Her Feet!!! Thank you for the awesome giveaway!!!! ?? Counting down to the end of this event. 27 hours to go. Join us for our next event starting June 12th! We already have around 40 author sponsors for that event. So many sound wonderful...Rogue Wolf, Stone Hard SEALs, & Wild Heat are a few that stand out for me. to find so many new authors to be on the lookout for! Fun contest, thanks! So many I love! Rogue Wolf, Not Vanilla - Voyageurism, Cheaters Anonymous, Stone Hard SEALs, A Leopard's Pass...to name a few sound great! Such a fun way to discover great, new books/authors. There are so many great authors and books in this awesome scavenger hunt. Just reading the synopsis of each book has me wanting to know what happens next. Also after looking at each author's page I discovered other books that I would love to read. On May 25, 2015, PamCraig said: Just a couple out of the many books. Thane's Redemption by Nina Crespo and What the Duke Wants by Amy Quinton especially caught my eye. I would like to read Lucy Monroe's Wild Heat (I've read her work for years), Lauren's Gilded series, Lexi Post's sci-fi, and Nina Crespo's paranormal, just to name a few. On May 25, 2015, Adnor said: Tammie has done it again! Tammie you ALWAYS have the BEST 'hunts' and the BEST prizes from the BEST authors! THANK YOU!!! what a great scavenger hunt - lots of great author - love it! On May 24, 2015, adila said: Love this Scavenger. 7 eBooks went to my Amazon Wishlist. Thank You. On May 24, 2015, skyeblue said: Scavenger Hunt! Love these scavenger hunts! I always end up buying several of the books listed there. On May 24, 2015, belgre said: Awesome Hunt! Learned about a lot of new authors! As usual I found many good books. I found that there were a few I already had there. They were Heather Long's Rogue Wolf, Celia Kyle's Dragon her Feet and Lia Davis' A Leopard's Path. I'm in a shifter mood at the moment. So many great reads & giveaways. Thanks. On May 23, 2015, Tara W said: Fun hunt- discovered new books and authors! I found some new to me authors and added some interesting new books to my wishlist. I would love to read Knight of Rapture by Ruth A. Casie and Viking Claim by Sky Purington. On May 23, 2015, Sable said: Great reads. Looks like some great reads and new authors will be making their way to my TBR pile. Can´t wait for my chance to start either one of them! I even went as far as going back to first-books-in-series and grabbing those to start a whole line of completely new books. Thanks for getting my eyes on these books and authors! Let's see, there's Tempest of Vengeance by Tara Fox Hall, Thane's Redemption by Nina Crespo, The Gilded Cuff by Lauren Smith and probably the entire Rocky Bluff P.D. series by F.M. Meredith and that's for starters. There are so many titles here that I would like to own, but most notably are Tave - The Ujal, Montana Snowfall, Rogue Wolf, A Taylor-Made Love and The Dragon King. Loved the Scavenger Hunt and finding out about so many authors who are new to me. I've already read Thane's Redemption by Nina Crespo and really enjoyed it. I can't wait to read Wild Heat by Lucy Monroe and Dragon Her Feet by Celia Kyle. Have a long shopping list from this hunt. Thanks!!!! On May 20, 2015, pansypetal said: So much to read . . . There are always a bunch of titles on this list that I want to read. Kills my budget every time! That being said, the one that caught my eye the most, and has been on my wish list for a bit it, The Guilded Cuff by Lauren Smith. It just sounds so fun and interesting. There are a lot of good books to read. I have found some historical books that sound really interesting. Many shifter books that I am looking forward to reading like Lia Davis, Celia Kyle and also books by Sabrina York and Roz Lee. to read any of them. I read all these genres. I've been looking forward to the Lia Davis for a while now. Some of the historicals have also made my list of books to check out. 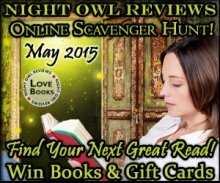 There are so many great authors and books in this scavenger hunt that I can't wait to read. Just reading the synopsis of each book, has you on the edge of your seat wanting know just what will happen next. Look at each author's page I also discovered other books by them that I would love to read as well! I would love to read Beneath the Surface and One Bite. On May 19, 2015, KatLouise said: So many great books! I don't know if participating in this contest is a good thing or not--I just added 11 books to my wish list! Dragon Her Feet and One Bite are currently my top two must-read books on this list. hoping to find a lot of good reads here. I'm loving the vast array of supernatural and paranormal options! Lots of great books. My credit card thanks you lol. There are a lot of choices in here. Some are more my style than others but I'm willing to give them all a chance. Added lots of books to wishlist. Thanks for the chance. I'm interested in the Wild Heat by Lucy Monroe and the Rogue Wolf by Heather Long. On May 16, 2015, AshleyAnne said: So much fun!!! This contest was so much fun! All the books look so good but I really want to read Rogue Wolf by Heather Long and Dragon Her Feet by Celia Kyle! On May 16, 2015, Judy Thomas said: Such Fun! I had so much fun entering, thank you .And I loved reading about so many awesome books.I am looking forward to reading them! I'm really interested in reading Dragon Her Feet by Celia Kyle. I love a good dragon book and this one sounds really good. On May 14, 2015, Prettyyoungthang said: so many stories! all of the stories look promising. On May 13, 2015, vickestolte said: Many great reads! I want to check out F.M. Meredith's books i love mystery and suspense! On May 13, 2015, wyndwhisper said: Can't wait to read this series! This is a great way to discover new books and authors! Plus, entering a contest? Wow! Thanks for the opportunity! I would enjoy many of these books but especially Montana Snowfall and What The Duke Wants. What a fantastic contest! I have added so many exciting books to my TBR list including titles by Celia Kyle, Jennifer Blackstream, Heather Long, and Candace Blevins. so many new authors to check out!! On May 12, 2015, jtouchstone said: building my wish list! So happy to have this list! Viking Claim by Sky Purrington and Stone Hard Seals by Sabrina are at the top of my reading lIst. They all sound like wonderful reads and so many talented writers. Thanks so much for this chance. I can't wait to read all of these! They all sound great especially the paranormal ones! I can't wait to read Wild Heat by Lucy Monroe and Seduced in Sand by Nikki Duncan. They both sound great. On May 08, 2015, SandyH said: too many books!!! i may have to retire earlier than planned in order to read all of these! On May 07, 2015, Natalie said: great books! I am really looking forward to reading VIOLENT DEPARTURES by F. M. Meredith. I found several new to me authors whose books look promising. On May 07, 2015, CandyLyn said: You have got to be kidding! The amount of books I am totally wanting to read may take more room than you have! Montana Snowfall, Not Vanilla, A Taylor-Made Love, Cheaters Anonymous, What the Duke wants, most of the ones in between and after...Basically, I'm not a fan of paranormal books but that is my own taste. All of the other ones? All for reading them and! Looking into other books those authors may have! A huge thank you for everyone involved in the amazing giveaway! It can't be easy to organize such awesomeness! I've found several books I want to read. On May 07, 2015, Ssernell said: You guys are awesome! This is such an awesome way to learn about different books I would normally pass over! There are so many books to chose from. I would love to try Afterlife by Zoe Dawson. Thank you for the awesome giveaway. On May 07, 2015, Betty said: Wow! So many books! So many talented authors! Wow! So many books~so little time! It kinda stresses me out to find so many books I want to read and not have enough time to dive in! One that really jumps out at me is VIOLENT DEPARTURES by F. M. Meredith~it's definitelygoing on my must read list. There's a lot going on in this book based on the Amazon summary~a missing college student, a possible haunted house and new staff in the police department! It sounds like a fast-paced, intense book! Thank you for another great contest! Lots of great ideas for books to discover new authors. I can't wait to try Thane's Redemption. There are so many great authors and books on the scavenger hunt. Also some I have never heard of but will be looking forward to reading. Love scavenger hunts---- bought 6 new books because of the blurbs. Roz Lee's books look great. On May 05, 2015, missyroth said: Fun! What a fun contest. Now I need to go back and add some to my TBR list! I've added several of these to my TBR list. I think the one I'm most looking forward to reading first is A Touch of Darkness. Thanks for featuring so many new to me reads! I would like to read, What the Duke Wants. On May 05, 2015, joytoread said: Love NOR Scavenger Hunts! NOR is awesome! I find more books to add to my TBR list here with the Scavenger Hunts. A Big Thank You. On May 04, 2015, Karen said: Love NOR scavenger hunts! What a Duke Wants by Amy Quinton is on my list of books to buy. On May 04, 2015, nikkitrueblue said: Books and Authors I HAVE TO READ NOW! On May 04, 2015, nikkitrueblue said: NOR'S SCAVENGER HUNTS RULE! I always look forward to NOR's scavenger hunts. I love discovering new authors and I hope one day one of my books will grace the NOR Scavenger Hunt. So many awesome authors and so many artistically crafted books to read. Blessings and Thanks to all. Definitely found some new authors and books that I added on my TBR pile. Looking forward to reading Wild Heat, Seduced in Sand, and What the Duke Wants. I can't make up my mind of which books to read first. This is another great selection of books to read. I am meeting so many new authors to me in this contest. There is a lot of books here I want to read. I can't wait to read What the Dukes Wants. So many other books sounds really good and it is hard to choose just one. What a great way to find books to read. Am making a list. On May 03, 2015, refhater said: Thanks! So many new awesome authors and books! Can't wait to read them all. Wow! Some new authors to add to my list & some my daughter added to hers! I really like the chance to find new author's to read. Some of the authors are favorites with books I haven't read. There are a lot of new-to-me authors with books to explore. On May 03, 2015, Laurel E said: Choose just one? There were several I would like to read, but Dragon Her Feet really caught my attention. Thank you for the fun Scavenger Hunt. I found many new authors and books TBR. Lots of books to choose from, want to win some Amazon bucks for books. They all sound really good but; I really want to read Seduced in Sand by Nikki Duncan and Wild Heat by Lucy Monroe. Thanks for the chance. So many books to choose from. I'm sure to read Viking Claim, among others. Thanks for the chance to win. I am excited about the contest. Any time I can have a chance to win a book or a gift card for a new book, it is a great day! Good Luck to all! I love these contest. So wonderful to see the new books by favorite authors and meet new favorites in the process. Thanks for the chance! Awesome contest. Thanks for the chance to win. Have added several new to me authors to my reading list. I keep finding "new to me" authors and new reads for me. I love that you don't just stick to one genre. I can never have too many books on my TBR list, or new authors to meet. :) Looking forward to reading some of these stories! I thought Cheaters Anonymous by Lacey Silks sounded interesting. On May 02, 2015, jaynep said: Scavenger Hunt! Thank you for the chance! I have got so many books on my tbr list that I don't know where to start. I love these scavenger hunts. I'm looking forward to reading The Dragon King, Tut's trumpet, Follow Your Heart, Her Alien Hero, and Invisible Journey. On May 02, 2015, Sylvie said: More Books! I've lost count of how many wonderful new authors I've learned about from these scavenger hunts and also the Monday author chats! This one is no exception, but I especially look forward to reading Jennifer Blackstream's One Bite. Its a crying shame. My want to read list is now so much longer after reading about all these great books. On May 02, 2015, GrumbleBee said: Interesting titles. Looking forward to reading Ashes & Ice. On May 02, 2015, amandastar said: Thank you! Thank you for a great scavenger hunt! There are many authors here I haven't read yet! I really enjoyed playing fill in the blank and I saw a lot of books and authors that I'll be looking into and adding to my "wishlist"
On May 02, 2015, gecko said: Love these Scavenger Hunts! I look forward to these Scavenger Hunts! Thank you! Looking forward to reading Nikki Duncan's novel. I really enjoy these hunts to discover new authors. I really want to read more. finding a lot of new authors to try. a great site to see what is out there. I really want to read Montana Snowfall by Caroline Fyffe. Wow, a lot of amazing books. Her Alien Hero is one of many that I would like to read. Awesome contest! And now I have a list of new to me authors to look for. I have been reading for years and I am excited for this. As if my TBR pile isn't long enough already, I picked up quite a few new ones to add to it. This has been one of the better Rafflecopters I have participated in! Hats off to you! Love the idea of the hunt to read about each book.... Thanks!! On May 01, 2015, LeaG said: The books that caught my eye. Since I write Time Travels the Viking one caught my eye. I also would be interested in the shifter stories. Actually all the books sounded. I am hoping some of these authors will be at RT. I am very excited for this giveaway and to get to know new authors. Found a couple of new authors I want to follow up on. There are so many interesting books, but I would most like to read The Gilded Cuff and Dragon Her Feet. I welcome the opportunity to become acquainted with more authors. I think the Sabrina York and Ruth A. Casie books sound interesting. Wow I love doing these scavenger hunts. It gives me the opportunity find new authors on here. I love these scavenger hunts. Thanks to all the authors that participate. Looking forward to reading new Lucy Monroe and Nikki Duncan books. Thanks for the contest and to all the authors that have went into this! On May 01, 2015, Lindsey said: Lindsey V.
I'm excited to read The Dragon King by Candace Blevins! Thanks so much. Lots of fun visiting new authors. I don't think I could just pick a few, I want to read them all. On May 01, 2015, moonfairy said: I'll take them all! Im such a book wh*re I want them all!!!! I love these. I found so many book and authors to add to my wish list. Thanks so much! On May 01, 2015, AnneC said: TBR pile is growing and growing! AfterLife by Zoe Dawson, Dragon Her Feet by Celia Kyle, Invisible Journey Book 4 by Mary Buckham and anything by Heather Long is going to be great. These are just some of the ones that really appealed to me. Love the selection. Looking forward to reading books by Sabrina York, Celia Kyle and new to me authors as well! Forgot to mention favorites such as Mary Buckham, Roz Lee and Jessica E. Subject. So many good authors and books! I love the scavenger hunts! I meet new authors and find new books every time. Thank you! I look forward to reading Stone Hard SEALS by Sabrina York. Thank you to all the authors. longest giveaway i've ever entered. the book selection looks great! On May 01, 2015, Lissasue said: thanks! There are so many books that sound so good! I don't know which ones I want to read first!! On May 01, 2015, Rush said: Wow! What great prizes! Thank you so much! On May 01, 2015, AddictedNikki said: Great Reads!! These were some great suggestions!!! I really enjoyed Wild Heat, Thane's Redemption, and Worth the Trade!!! Thanks for the chance. I hope I win something this time. This was cool I found a lot of interesting books that I wouldn't know about. On May 01, 2015, Geargoyle said: So many wonderful choices! There are so many great sounding books here, I don't know how to choose! Rogue Wolf, The Gilded Cuff, The Dragon King, A Leopard's Path, and AfterLife are all on my to-read list! Thank you for another fabulous giveaway! I have a couple of authors on here that I love to read: Heather Long and Celia Kyle. But now I need to get a 2nd job because I have just found a lot of new ones that I want to read. Thanks for the contest! Thanks to all the great authors I have to read all of these books. Rogue Wolf by Heather Long sounds great. The series is a favorite of mine. I've read Dragon Her Feet by Celia Kyle and it was awesome (as usual). On May 01, 2015, thumper said: Thank you! Thanks to all the great authors for participating. I found too many new books to try to list them all!! Thank you to all of the great authors. Need to check out these books. They sound interesting. Thanks for the giveaway. On May 01, 2015, SerenaS said: Great titles! The MacLomain Series by Sky Purington sounds like a great series and I also like Blood Prince series by Jennifer Blackstream. On May 01, 2015, kporter said: Awesome Giveaway! I always love these events. Sounds like fun. I'll be sure to share it everywhere.